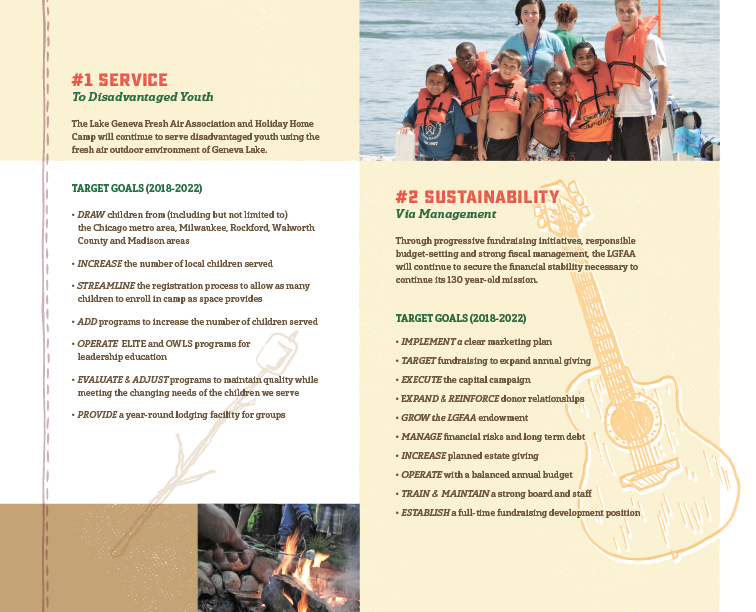 Holiday Home Camp funds the majority of its annual operating budget through private donations. The cost for a child to attend one session of camp costs approximately $1,200. 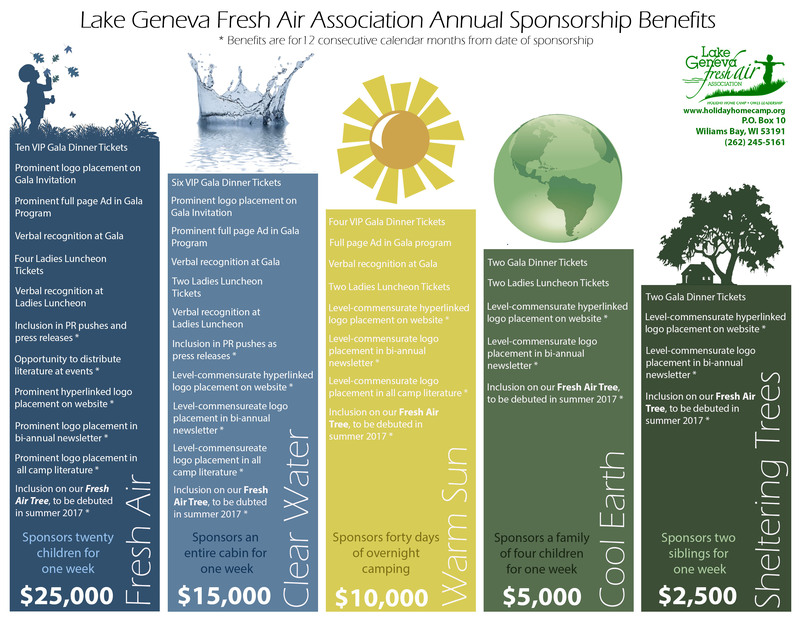 The Lake Geneva Fresh Air Association seeks annual donations that help to sponsor individual children hoping to attend Holiday Home Camp. 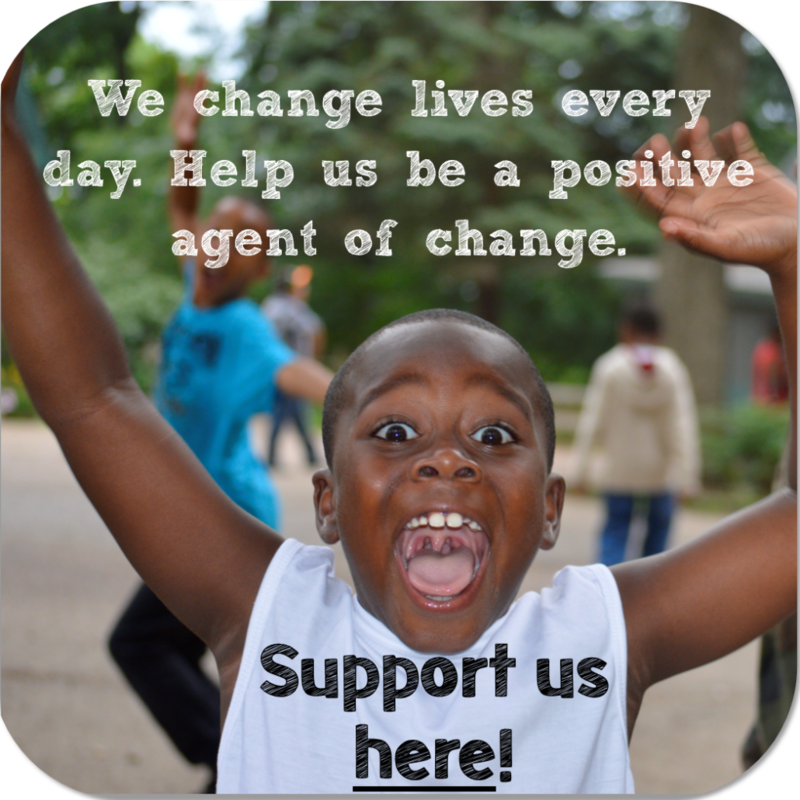 Please become a member of our ongoing annual campaign that provides exceptional support to these deserving children. 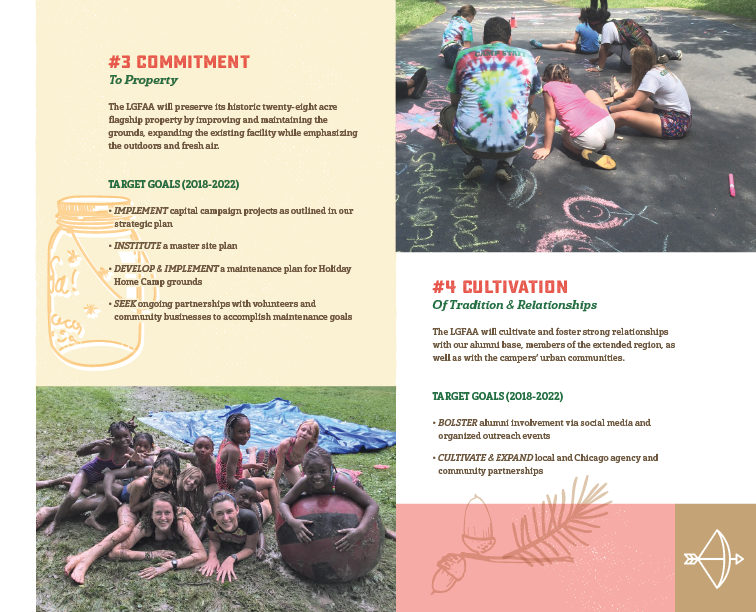 Although a gift of any amount is appreciated, we hope you will consider a donation to one of the following levels which represent the fundamental elements that offer our children an opportunity to grow. 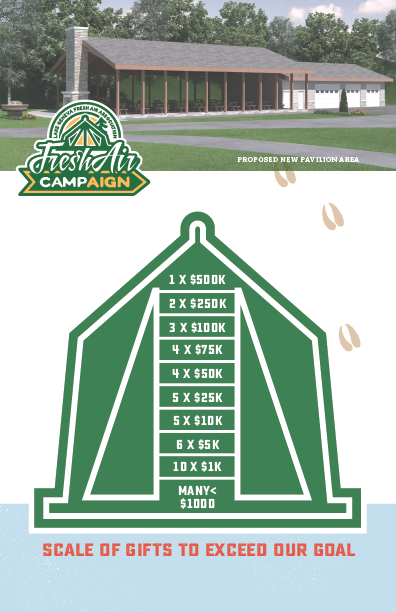 Our new capital campaign has officially begun! We have big plans for keeping our mission healthy and growing, with new outreach programs, facility renovations, and even a new building. We have a lot to be excited about and A LOT to share. Contact us directly if you would like more information or to get involved. 262-262-5161. 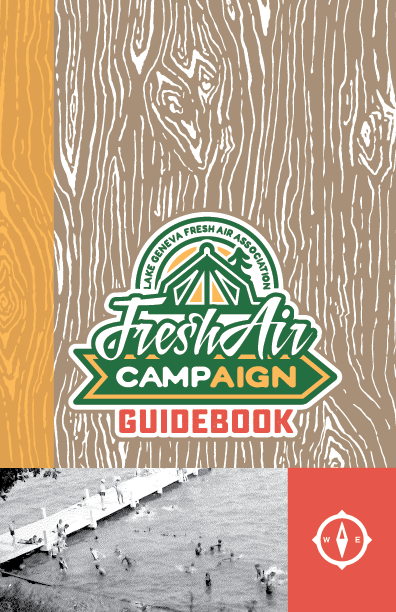 This campaign guidebook was specifically created to showcase the thoughtful focus of our campaign needs and what, we are looking to accomplish. With your help we can realize all of the campaign goals and ensure HHC continues to provide life changing experiences for future generations. 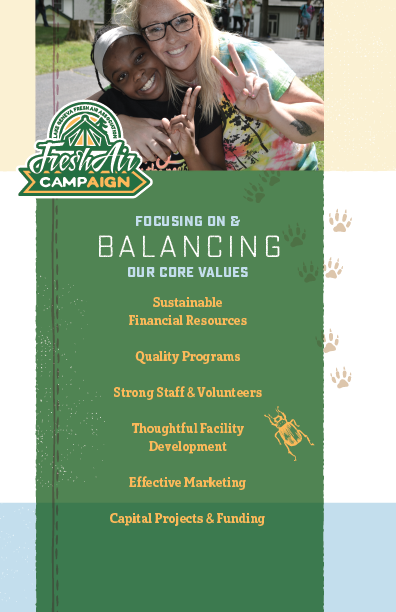 The initiatives that we are focusing on fall within our 4 main timbers of focus. 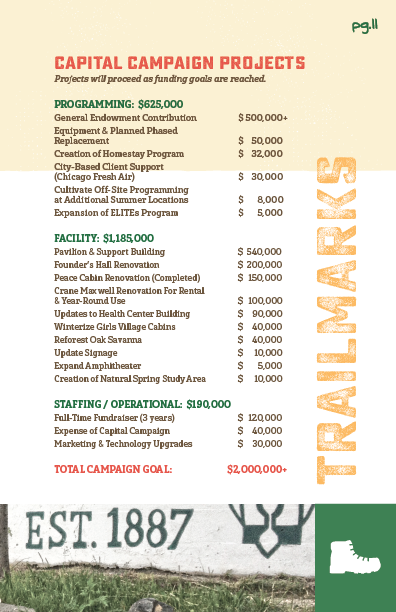 Many of the projects and programs listed above are directly related to the planned expenses listed here. The proposed pavilion area and storm shelter is an important part of our continues growth. Providing a safe place for the kids to learn and grow is a key focus of our mission. ***All donations will be acknowledged by a thank you and receipt for your tax records. All donors will be recognized in our “Honor Roll of Donors” that is published periodically throughout the year and in the annual report issued in February for the previous fiscal year. 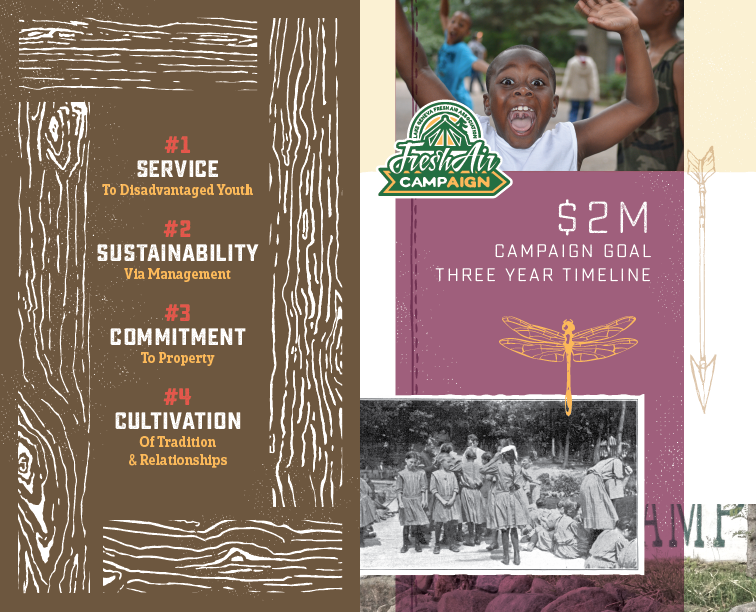 In addition, donors with cumulative gifts within a fiscal year that exceed $1,200 are automatically welcomed as members of the “Founder’s Society” which is an annual recognition of individuals and businesses whose deep commitment to providing disadvantaged youth with a fresh air, outdoor summer enrichment experience continues the vision of the camp’s original founders in 1887. 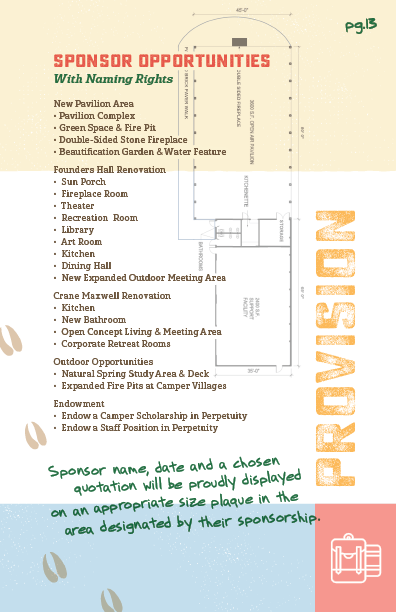 Membership benefits in the “Founder’s Society” include invitations to special events including an annual appreciation reception at the end of the summer (September) as well as prime seating at Holiday Home Camp’s various fundraising events and additional recognition in the published “Honor Roll of Donors” and special listing on the camp’s website. Honor a special person on the occasion of a birthday, anniversary, birth, marriage, adoption or death with a contribution to Holiday Home Camp. Just add a note or contact the camp office to indicate the person(s) you wish to honor this way and we’ll send them a note notifying them of your consideration in this meaningful way. Take advantage of tax advantages by transferring appreciated stock to Holiday Home Camp. Please call (or have your stock broker call) Brad Cripe, Executive Director: 262-245-5161 extension 14 or brad@holidayhomecamp.org for assistance and transfer instructions. Please remember Holiday Home Camp’s kids in your estate planning. Please call Tim Magill at the camp office (262-245-5161, time@holidayhomecamp.org) and your financial advisor for more information on powerful ways to increase your gifts while taking advantage of potential tax and income benefits. Double your gift through a matching gift program, which may be available through your employer! 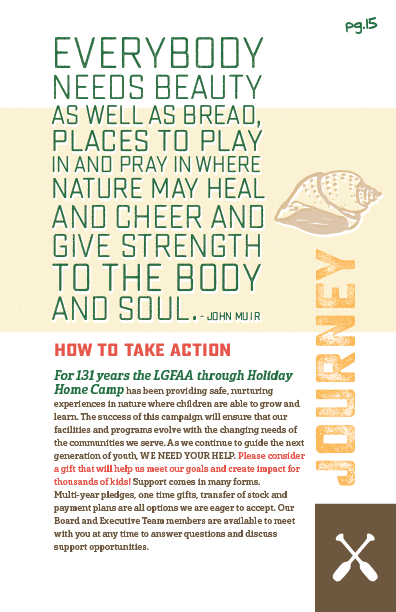 Please check with your employer and, if applicable, enclose a matching gift form with your gift to Holiday Home Camp. In-kind gifts are also most welcome! Every non-profit organization relies heavily on donated goods and services from individuals and companies. THANK YOU FOR YOUR SUPPORT OF OUR KIDS! !